Staff turnover has always been a challenge within the assisted and senior living communities. However, this problem is becoming even more significant with the rise of the baby boomer population now reaching retirement age and entering these facilities. According to a recent study, the average employee turnover rate in this industry is 42%. One of the primary reasons for high turnover is low wages and poor benefits packages. However, there are other benefits that can be offered to staff members outside of compensation that can reduce turnover and increase retention rates. When designing a senior living community or assisted living environment, we always recommend starting with your residents in mind. But, it’s also important to consider how design can improve the wellbeing of your staff members. Staff Lounges – Staff Lounges offer a place of peace and solitude where employees can relax before, during, or even after a shift. Make sure the lounges are easy to access and include comfortable couches, tables for eating lunch, and other amenities such as free snacks or coffee. Natural Light – Just as natural light is important for residents, it’s also important for the wellbeing of your staff members. We recommend designing lounges, kitchen areas, and hallways with windows that offer access to natural daylight. This will promote better sleep health and happiness in the workplace. Outdoor Living Spaces – Gardens are known to improve memory care and offer a place for residents to enjoy with their friends and family members. But, they can also provide similar benefits to staff members. According to a study by OZ Architecture, many staff members reported that there were lots of spaces for residents to enjoy, but there weren’t any dedicated outdoor spaces for them. We suggest designing an outdoor space that connects to the breakroom or staff area where employees can enjoy the benefits of nature while on break or at lunch. Locker Room or Changing Facility – Offering staff members a locker room provides them with a place to keep personal belongings so they don’t have to worry about where to put things like their keys or a sweatshirt on the job. Providing a changing room or a shower area also gives staff a place to freshen up after a long day on the job. For the staff members that ride their bike or walk to work, it also gives them a place to rinse off before starting a shift. 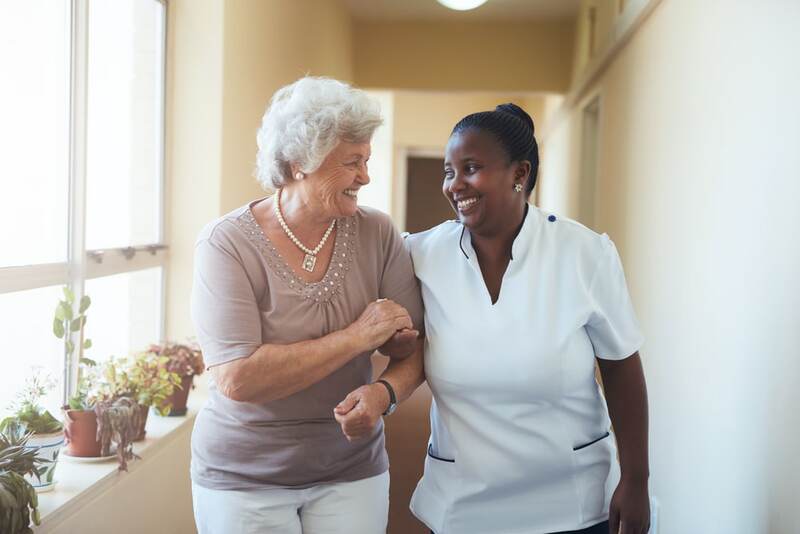 While it is often important to start designing with your residents in mind, we also suggest considering how design can impact your staff members. Interior design can offer alternative and competitive amenities that will, in turn, lead to stronger employee happiness in the workplace. And when staff members are happy, they are able to provide the highest level of care for their residents. Our team is happy to help you with any questions you may have regarding the design process for your team members. Feel free to contact us and check out our portfolio here.